Details Our Italian Brown Ocher (Goethite) is from deposits in northern Italy. A yellow to brown mineral, consisting of hydrated iron oxide, usually present in the oxidized portions of iron ore deposits, and the commonest constituent of many forms of iron oxide. Our brown ocher pigment is finely ground and exhibits a reddish brown masstone. It has good tinting strength and covering power. Rublev Colours Aqueous Pigment Dispersions are pigments dispersed in water ready to be mixed with water-based mediums. These dispersions are especially made for use with traditional painting mediums, such as egg, casein, fresco, watercolors and distemper (glue tempera). They are also ideally suited for use with gesso for making toned grounds for drawing and painting. Pigment dispersions from Rublev Colours contain only naturally-derived ingredients, in addition to pigment and water, making them ideally suited for traditional and natural mediums. Unlike other pigment dispersions that are typically made for acrylic medium, Rublev Colours Aqueous Dispersions do not contain coalescent solvents, artificial dispersing resins and other additives that interfere with natural mediums. Rublev Colours Aqueous Dispersions make preparing traditional mediums easy; you do not have to hassle with powders, grinding pigments with expensive tools and calculating pigment-binder ratios to make water-based paint. They make adding the right amount of paint binder simple and easy. For example, preparing egg tempera has never been easier, because the dispersion makes measuring the right amount of pigment easy—you simply add egg and stir—there's no guessing how much egg to add to the pigment. Mars Yellow and Mars Brown are names given to the artificial substitutes for goethite. Goethite was named for Johann Wolfgang von Goethe (1749-1832), a German philosopher and poet who also was a mineralogist. Goethite has been in continuous use as a pigment since prehistoric times. Evidence of goethite was found in paint pigment samples taken from the caves of Lascaux, France. In ancient Greece the term "ochre" was used for natural earth pigments of different yellow hues (ochre light, golden, dark, greenish, etc.). This widespread mineral, consisting of hydrated iron oxide, which is encountered practically everywhere on the earth's surface in the form of concretions, oolites (a form consisting of small round grains cemented together), reniform (kidney shapes) or botryoidal (form of bunches of grapes) accumulations. It is frequently encountered in swampy areas at the head of spring waters, and on the bottom of lakes and small creeks. Iron oxides, or earth pigments, as they often are called, are an important group of inorganic pigments derived from minerals. Iron oxide pigments are yellow, red, brown and green, but artists know them as ochre, sienna, red oxide, umber and terra verte. Unlike pigments made in a laboratory, the color of natural iron oxide pigments varies with the composition of the particular segment of earth from which they come. The color of these pigments is derived from three constituents: the principal coloring ingredient, secondary coloring ingredients and a base. The combination of these ingredients produces the particular color of the earth. The innumerable forms and variations in which these ingredients can combine result in the wide range of possible yellows, reds, browns and greens. Principal coloring ingredient: Iron oxide is the principal color producing ingredient in the earth. The properties of the particular iron oxide present in the earth determines its color. The nature of the iron oxide found in the deposit, rather than its percentage, is critical to the resulting earth color. Most rock contains some iron oxide. Those bearing the least amounts are limestones. white clays and colorless kaolins. Those containing the highest amounts are the rocks from which metallic iron is extracted. Secondary coloring ingredients: Calcium, manganese oxide, carbonic materials, silica and limestone are some common modifiers that affect the specific color of natural iron oxides. Manganese oxide, for example, enriches the brown in umbers. Base: Nearly all iron oxides have a clay base. Clay is the weathered product of silicate rocks and is extremely varied in composition. As a result, it has numerous effects on the earth's color. Our brown ocher or goethite is from deposits found in northern Italy in the Verona region. It is finely ground and has a reddish-brown masstone. It has excellent tinting strength and good covering power. Relatively large crystals of goethite give the yellow color of this mineral, whereas smaller crystals produce shades of brown. As demonstrated in experiments conducted by K. I. Tolstikhinoy, the chromacity of natural iron oxide and clay pigments are closely related to the content of iron oxide, and from a mineralogical point of view -- the content of goethite. Thus, with the content of iron oxide less than 23%, luminosities of the tone of pigment compose 40-50%, the purity of tone 60-70%. 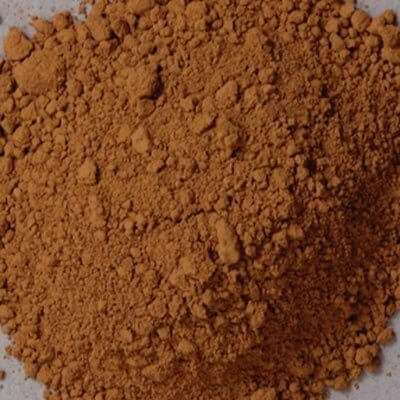 With the content of the iron oxide from 22 to 74%, luminosities of tone varies in interval of 25-40%, the purity of tone from 70 to 85%, and with the content of the iron oxide more than 75%, luminosity is located in interval of 18-25%, the purity of tone 83-90%. A characteristic of pigments containing goethite is their ability to change color when heated. Heating ochre, sienna and umber causes the hydrated iron oxide to give up water, and with the resulting dehydration darken in shade while its tone intensifies. At temperatures exceeding 300°C yellow pigments acquire red-brown tones. The most intensive red tones are obtained as a result of calcining goethite at a temperature between 500-600°C. The change in color is directly related to the dehydration of goethite and its transformation into hematite. Prolonged heating at high temperatures causes another change into a mineral of dark gray color -- magnetite. Goethite or brown ocher does not react with other pigments and is effectively used in fresco, oil, tempera and watercolors. It is considered to be permanent with medium to good tinting strength and opacity. It does not react with solvents, and is indifferent to alkalis, but is partially soluble in acids. 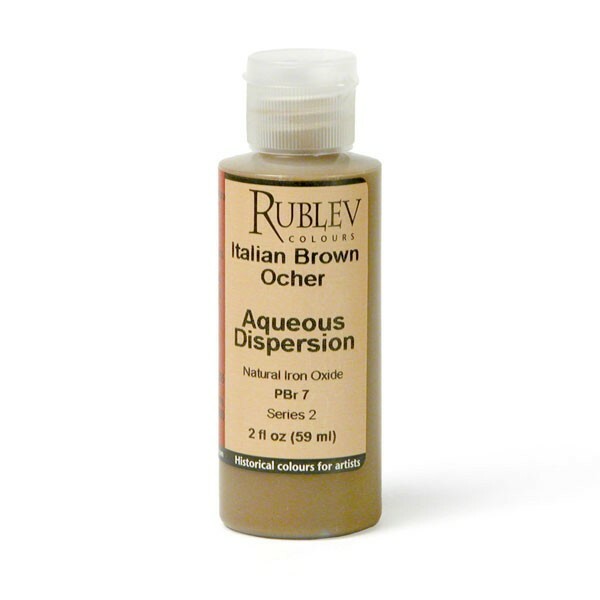 Brown ocher moderately absorbs oil when dispersing the dry pigment it in this medium. The oil absorption ratio is 23–35 parts by weight of raw linseed oil to 100 parts by weight of pigment. If the measurement were grams, it would require 23 to 35 grams of linseed oil to grind 100 grams of pigment to form a stiff paste. Brown ocher is not considered to be toxic.